4-CD Box/1DVD (LP-size) mit 114-page hardcover book, 96 tracks. Total playing time approx. 257:20 mns. RCA's top brass in New York rolled out the red carpet for a troupe arriving from Tennessee. And they should have. Corporate HQ had long ago stopped laughing at its country division as first Steve Sholes and then Chet Atkins made the Nashville branch into a goldmine that delivered hit after hit year after year. Several artists on the roster, Eddy Arnold, Hank Snow, Don Gibson, Jim Reeves and Bobby Bare, delivered not just country hits...but pop hits, and not just national hits...but international hits. Now a delegation from Nashville was to fly to Germany to introduce Europe to the Nashville Sound. lt was a time when the music world was consumed with all things British, and it was a bold move to bring American country acts to Europe. RCA, though, was desperate. The company had no acts to compete with the Beatles, and, in the spring of 1964, country music looked like RCA's best bet for beating back the British. Jim Reeves could look back on 25 Top 10 hits in the 'Billboard' country charts, and several of those had cracked the pop charts as well. He'd done almost as well overseas. Bobby Bare had gone pop with Shame On Me and Detroit City, and had just delivered his knockout punch, 500 Miles Away From Home. Even Anita Kerr (as Anita And Th'So-And-So's) had scored a Hot 100 with Joey Baby. At 2:00 pm on April 2, 1964, RCA's corporate managers hosted a reception for the Nashville troupe at Lufthansa's VIP lounge in New York's John F. Kennedy International Airport. Jim Reeves (aged 40) was the only one to show his colours as a Texan by wearing a pair of cowboy boots. Bobby Bare (29) wore a lounge suit, while Chet Atkins (39) passed around a Stetson hat that Anita Kerr jokingly put on her bobbed hair-do. One of RCA's staff photographers snapped away, recording the event for the company's in-house magazine. They all tried to loosen the somewhat stiff atmosphere, but they would have preferred to be boarding their tour buses rather than a plane bound for Hamburg. Richard Weize”s 1964 report for the fanzine 'European Hayride' showed that fans were excited that real country music was coming to Hannover. Weize's favorite stars were Jim Reeves, Bobby Bare and Chet Atkins, and he made a 100 km trip by train from Bad Gandersheim to the capital of Lower Saxony. While Ronny sang Oh, My Darling Caroline, Weize left the hall to look for the organizer. He asked whether he could go backstage, and was told he could. The meeting with Chet Atkins was immortalized in a photo, and another photo captured a private conversation with Bobby Bare. Only Jim Reeves' legendary brusqueness was a disappointment, but Reeves made up for it when he performed. Weize was transfixed by these appearances, and didn't mind missing the last train home. Even the critic for the local Hannover newspaper was impressed with the country stars: “The Anita Kerr Singers, Bobby Bare, Jim Reeves and Chet Atkins made a dream come true for the audience, which had been adoring them for years, by standing face to face with them. Nearly all of them were armed with guitars and behaved so modestly, that you nearly couldn't believe it. They all know how to connect show business with art." Richard Weize's eyewitness account of the Hannover show and Alfred and Gertrud Schindler's account of the concert in Essen clearly show how much more the German country fans knew compared with the press and the organizers. ln the fans' eyes, even the sidemen in Jim Reeves' Blue Boys - Leo Jackson, Dean Manuel, Henry Strzelecki and Ken Buttrey - were much more important than the members of the RIAS-Tanzorchester could ever be. 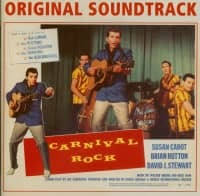 In 1964, the Nashville style wasn't imitated by German musicians. Chet Atkins' fingerpicking was only known to some insiders. And Dean Manuel's piano playing was a revelation: for the first time Old Europe heard in-person the 'slip note' piano style that Don Robertson and Floyd Cramer had invented and was still in fashion in the Nashville and Los Angeles studios. The musical program varied slightly from town to town, and from country to country. Bobby Bare, for instance, did a medley in Stockholm that parodied his fellow artists, from Johnny Cash to Elvis Presley. Chet Atkins ensured that his successes as a producer - Don Gibson's Oh Lonesome Me and I Can 't Stop Loving You, for instance - were reflected in his shows. After all, it was a promotional tour to Showcase RCA Nashville. lt was also meant as just a beginning. At Teldec in Hamburg and at RCA's Geneva headquarters, there were already plans underway to bring in more artists. 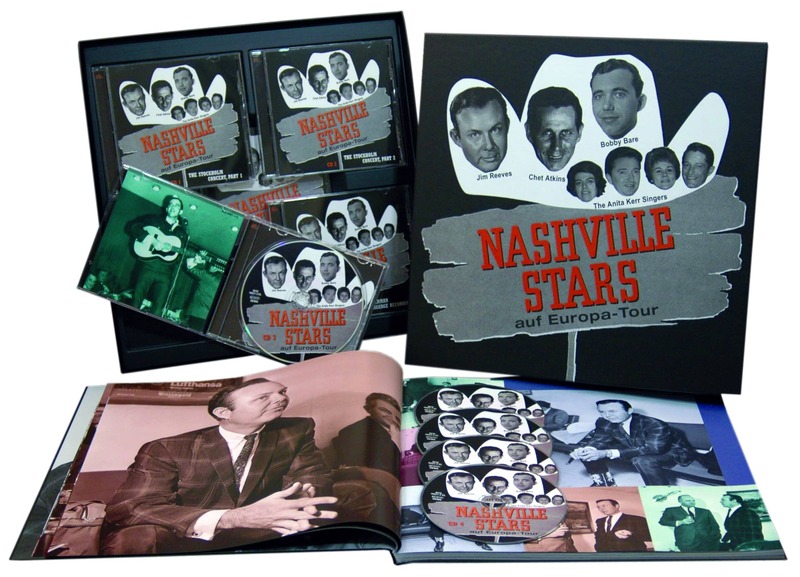 Customer evaluation for "Nashville Stars On Tour (4-CD - 1-DVD)"
I have many Bear Family boxed sets in my collection and this boxed set is excellent as I have come to expect from Bear Family. Being a great fan of Classic Country Music and of Gentleman Jim Reeves in particular, I would recommend this boxed set to anyone. If you have wondered how Jim Reeves sounded in concert, this is a set you need to have on your collection. The technical quality of the recordings made in Stockholm and Oslo put you right there in the audience, and oh how I wish I could have been there in person! In diesem April jährte sich zum 60. mal die Europa-Tournee der RCA-Country-Stars. Im Jahr 2007 brachte Bear Family eine CD/DVD-Box mit allem verfügbaren Material zu diesem Event heraus. 5-CD-Box mit 119 Aufnahmen, Hartcover-Booklet im LP-Format mit 114 Seiten. Im April 1964 schickte die US-Plattenfirma RCA einige Country-Künstler auf Promotion-Tour durch Europa. Start war am 2. April vom New Yorker John F. Kennedy International Airport. Am Freitag, dem 3. April schwebte die Lufthansa Boing 727-200 mit der Truppe bei regnerischem Wetter in Hamburg ein. Ihnen blieb der Samstag zum Akklimatisieren, am Sonntag dann folgte der erste Auftritt in der Hamburger Musikhalle. Bis zum 20. April war das Programm voll, lediglich am 12. April hatten sie einen freien Tag in Berlin. Das übrige Programm: drei mal Frankfurt, je ein Tag in München, Wien, Hannover, Essen, Kopenhagen, Stockholm, Oslo, Den Haag, Amsterdam, Karlsruhe, Brüssel und schließlich der Rückflug nach Nashville. Neben Live-Konzerten in großen Hallen gehörten auch Auftritte bei den amerikanischen Truppen zur Tournee, außerdem Fernsehaufnahmen. In monatelanger Arbeit, mit viel Geduld und vielen Helfern hat Bear Family alles zusammengetragen, was über diese Tournee noch existierte. Herausgekommen ist eine wieder einmal spitzenmäßige CD-Box. Die erste Compact Disc enthält den ersten Teil des Konzertes in Stockholm mit den Blue Boys, den Anita Kerr Singers, Bobby Bare und Chet Atkins. 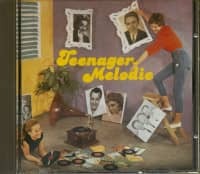 Die Künstler bringen hier im Wesentlichen ihre eigenen Hits und Standardsongs: „Oh Lonesome Me", „Night Train To Memphis" (Anita Kerr Singers), „Detroit City", „500 Miles Away From Home" (Bobby Bare), „Wildwood Flower", „Tiger Rag" (Chet Atkins). Besonderer Höhepunkt ist ein Medley mit Bobby Bare, bei dem dieser andere Künstler wie Johnny Cash, Elvis Presley, Hank Williams oder Tex Ritter parodiert. Die zweite CD enthält dann das Konzert von Jim Reeves vom gleichen Abend. 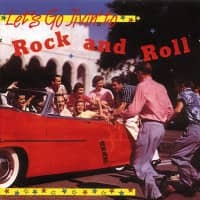 Sein Programm bestand aus den Titeln „Billy Bayou", „I Love You Because", „Bimbo", „Four Walls", „He'll Have To Go", „Yonder Comes A Sucker", „Adios Amigos", „I Can't Stop Loving You", „Mexican Joe" und „Danny Boy". Alle Aufnahmen sind qualitativ ausgezeichnet, für damalige Verhältnisse sehr hochwertig. Das Gleiche gilt auch für die Live-Mitschnitte aus Berlin und Hamburg, die auf der dritten CD zu hören sind. 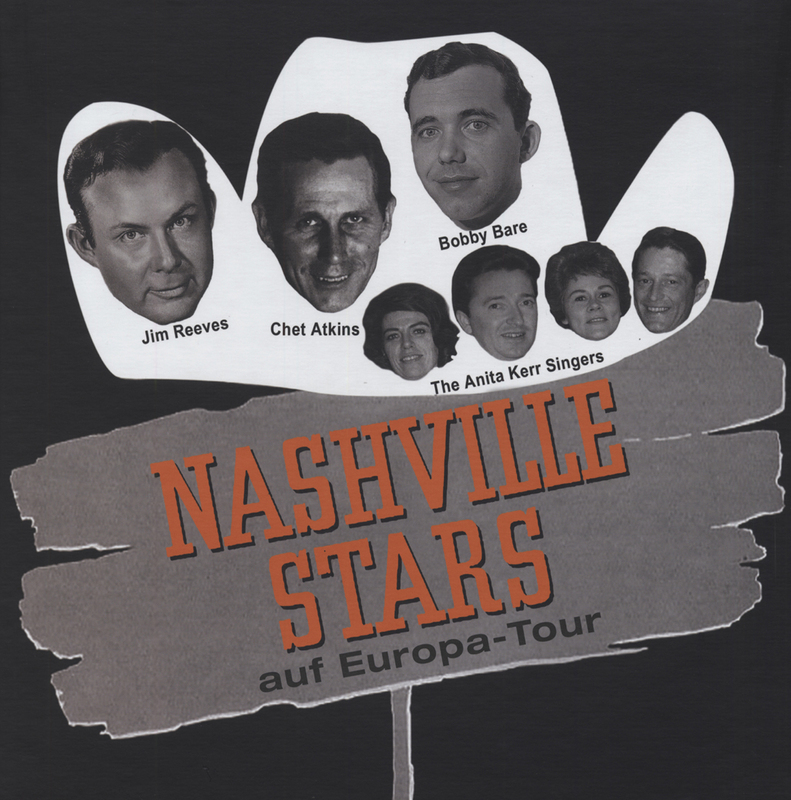 Die 17 Titel wurden seinerzeit auf der LP „Nashville Stars On Tour" veröffentlicht, sie wurden für die Schallplatte zusammengestellt, die kompletten Mitschnitte sind nicht mehr aufzufinden. An diesen Abenden waren auch das Orchester Werner Müller, Vico Torriani und Ronny beteiligt. Torriani macht auch die Ansagen in einem komisch anmutenden Englisch. Die Gesangsnummern der deutschsprachigen Künstler sind nicht überliefert. Am 7. April wurden in München die Aufnahmen für drei Fernsehshows aufgezeichnet, die dann Ende des Jahres ausgestrahlt wurden. Am Ende jeder Show singt die gesamte Tourneetruppe das Lied „Deep In The Heart Of Texas", einmal mit Gus Backus, einmal mit Bill Ramsey und einmal mit Vico Torriani. Zum Ende der dritten CD können wir ein Interview der Niederländerin Kitty Prins mit Jim Reeves hören. 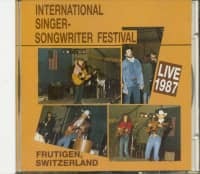 Die vierte CD vereint alle deutschsprachigen Aufnahmen der vier RCA-Tournee-Künstler plus weitere ebensolche Stücke mit Jim Ed Brown, Stu Phillips, Willie Nelson und Skeeter Davis. Die meisten Lieder haben mit Country-Musik nicht mehr viel zu tun, es sind Schlager, die eigentlich nur durch ihre Interpreten interessant sind. Während ich die ersten drei CDs gehört habe, stellte ich mir immer wieder vor, wie schön es wäre, wenn es von diesen Aufnahmen auch einen Film gäbe. Als ich dann die fünfte CD mit dem Mitschnitt des Konzertes vom 15. April in Oslo einlegte, machte mein CD-Player schlapp und sagte mir unmissverständlich es sei keine CD eingelegt. Kein Wunder, denn dabei handelt es sich um eine DVD. Sie enthält zunächst einige kurze gefilmte Eindrücke von der Ankunft der RCA-Tournee in Amsterdam. Sodann singt Jim Reeves in der Flughafen-Lounge „I Love You Because", nur von seiner Gitarre begleitet. Anschließend dann live und in schwarz/weiß 22 Titel, vom „Steel Guitar Rag" der Blue Boys über drei Titel der Anita Kerr Singers zu vier Songs mit Bobby Bare, ehe dann Meister Chet Atkins in die Saiten greift. Einige Stücke spielt er zusammen mit der Band, andere trägt er allein vor. Bei den letzten beiden Titeln „Peanut Vendor" und „Tiger Rag" wird er wieder von den Blue Boys unterstützt. Fünf Titel mit Jim Reeves beenden das Programm, zum Abschluss singt er dann passenderweise "Adios Amigos". Neben den interessanten optischen und akustischen Eindrücken von DVD und CDs muss auch das umfangreiche Booklet erwähnt werden. Wie immer sind die Macher von Bear Family den damaligen Fotografen solange auf den Fersen geblieben, bis sie auch das letzte Negativ ihrer Bildserien herausgerückt hatten. Außerdem sind die damaligen Berichte von Augen- und Ohrenzeugen hier wiedergegeben, auch von Richard Weize, der seinerzeit in Hannover dabei war und sogar hinter der Bühne alle Künstler traf. Zusammen mit Dutzenden von Konzertfotos, Nachdrucken von Briefen und Verträgen - ein Buch, das man immer wieder zur Hand nehmen kann und jedes Mal entdeckt man etwas Neues.